I read both of these books so quickly, there was no way to limit myself to just one book per review. Couldn’t do it. Let me just say that I tore through both of these books and now, January can’t come soon enough. 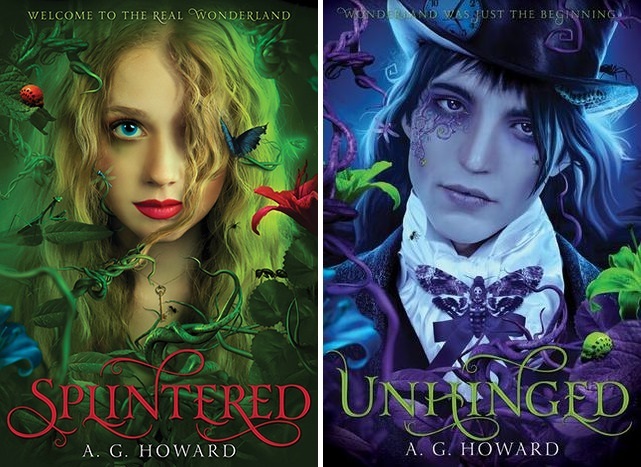 Here is my review of Splintered and Unhinged by A.G. Howard. First off, look at that cover art. JUST LOOK AT IT! IT IS GORGEOUS!!! Secondly, you should know that there were several things that made me want to love this series right from the beginning – my love for fairytale retellings, and my love for all things Alice in Wonderland. This story takes Wonderland and turns it on its ear a bit. It’s not a whimsical, fun, colorful place. This Wonderland is dark, twisted and treacherous. And awesome. The story follows Alyssa Gardner, who is the many-times-great-granddaughter of Alice Liddell, the original girl that Lewis Carroll wrote his books about. Alyssa has been teased all her life about this, but the kids at school don’t know the half of it. Alyssa can hear bugs and flowers talking to her. Her mother has been institutionalized because she has gone crazy, living in an imaginary world that everyone thinks is inside her head, a hereditary mental illness that has affected the Liddell family through generations. Alyssa is afraid of going crazy herself, but of course, we find out that none of them have ever be crazy. It’s all true. Wonderland is real. And it’s in trouble. Enter Morpheus – the caterpillar-turned moth-turned human who visited Alyssa in her dreams as a child and who is now trying to get Alyssa back to Wonderland to help save it. Alyssa has to try and undo some of the things that the original Alice left behind, but everything from the original story is slightly different. We meet all the usual characters – the “White Rabbit” (who is not actually a rabbit), the Mad Hatter, the March Hare, and others. The story of the Walrus and the Carpenter takes on a new light as well and, let me tell you, it is nightmare-worthy. In a good way. And of course, there is also the Red Queen, who is causing nothing but trouble. Speaking of trouble, Alyssa accidentally brings along someone else when she heads down the rabbit hole – Jeb, the boy who lives next door, who has both been her best friend and secret crush. Naturally, there is a bit of a love triangle between Alyssa, Jeb and Morpheus, but this is a YA book, and we all know how much YA loves a good love triangle. The thing that makes these books wonderful is the same thing that makes the original novel so much fun – anything can happen. You can’t predict anything when it comes to Wonderland because there are no rules, or at least, none that we can follow. The story twists and turns so many times that it is a constant surprise, which is what made it so hard to put down. Unhinged ended on such a cliffhanger that I need the next book right now. Right now. No really. Right. Now. Unfortunately, book three, Ensnared, doesn’t come out until January. Boo. Seriously though, if you like Alice and you love new spins on classic tales, pick up these books. You won’t be sorry. I highly recommend them, in case that wasn’t clear. 😀 They are really good. I think you made it very clear. Just may have to get these. Sent this on to the other author- reader in the family.